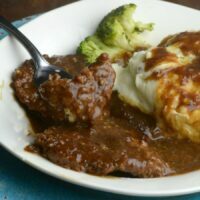 There is no greater comfort food than this Instant Pot Cubed steak and gravy. It falls apart tender, extra juicy, and the gravy is something to swoon over. Serve it up with some Instant Pot Garlic Mashed Potatoes and you have a meal fit for a king! But, I can’t stop there, this dish can be made in just 10 minutes with the help if your magic pot, I mean instant pot! That is right, once again the instant pot swoops in to make dinner a breeze, Bon Appetite! I grew up eating cubed steak covered in a gravy, as chicken fried steak, and just pan fried. The one thing I remember is you never knew how tender the meat would be. Depending on how you cook cubed steak, or how tenderized it is will allows change your end result. But when you toss it in the instant pot, it heats it with steam which helps break down the meat and really tenderizes it like crazy. So that you can easily just cut your meat with a fork. When you allow the instant pot to natural release for five minutes is where the magic happens. This helps tremendously in tenderizing your meat, that is a trick I learned early on. I use it for most of my dishes that might have a bit of a tougher meat. 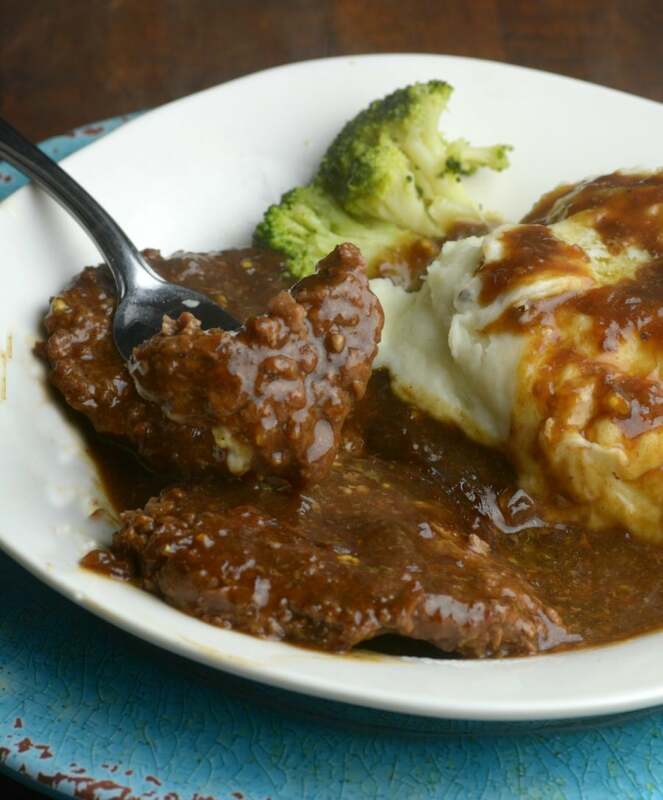 Once you make Instant Pot Cubed Steak and Gravy, I promise you won’t go back to stovetop or oven methods. You can’t get the same tenderness and juicy flavors without the instant pot. Plus this dinner is super affordable, so if you are a tight budget, this is one dinner I recommend. I think every family has had hard times and you have to get creative with meals so that you can afford it. This is pretty affordable, especially if you buy your cube steak on sale. Here are my favorite Instant Pot Side Dishes to go with the amazing Instant Pot Cubed Steak and Gravy! Also if you are on the hunt new recipes to try out in your instant pot, or meals that fit a budget, check out my month of instant pot meals on a budget. You will find a full month of instant pot recipes that are affordable and wholesome and nutritious. I created this to help give everyone a good guide to finding meals you can cook for yourself or the family, and having a nice variety. Sometimes I get stuck in a dinner rut, and I need change and being able to try new dishes always help keep the whole family excited about what will be served up that night. You can have a hearty dinner on the table in under 15 minutes the best part is everyone will love it. Pour in your can of onion soup and fill the same can with water and pour in. Place your IP on Manual High Pressure for 4 minutes. Do a natural release for 5 minutes then quick release and place your instant pot on saute. Bring to a boil and whisk in cornstarch if your gravy is not thick enough. Next Post → Are You Getting Enough Vitamin C? Oh man, this looks good! I’m having a love affair with my Instant Pot right now. This is definitely going on my list of recipes to try next. It seems like the perfect easy weeknight meal! I would serve this with rice or mashed potatoes. I made this with my Power Pressure Cooker XL (similar to Instant Pot) tonight and it turned out great! I lightly breaded my cube steak with seasoned flour and then lightly browned stove top. Then I put them in the electric pressure cooker for 18 minutes on “meats” and used all of the ingredients that you listed. I don’t have the high pressure option but the 18 minutes turned out perfectly. Thanks for this recipe!! Thanks, I too have your same pot and have difficulty determining how to make the recipe work. Could you do this with out the onion soup in the ppcxl? I’m making this tonight with the power pressure cooker XL as well. Hope it turns out well! Was your meat tender? The time difference really shouldn’t be necessary. Check out your manual. I have a farberware brand and all but the fish, slow cooker and I think the veggie are on “high” like the instapot “high” manual mode. I just use the beef preset and change the time to whatever the recipe says. I’ve used every recipe interchangeably regardless of the brand of pressure cooker listed in the recipe and have had no issues in 2 years. I made this tonight, but the cube steaks were chewy. I am a brand new user to the instant pot, with this recipe being only the 3rd recipe I have made. I had 4 cube steaks, but total weight was less then 2 pounds. I did them 4 minutes. Then the quick release. Since they were still chewy…. should they have been cooked a couple minutes longer…. or did I cook them too long? From what I’ve read , you really shouldn’t quick release any meats. I’m wondering if that may be why they turned out chewy. Yes Kimi, thanks for catching that. I made them again tonight, and this time after the 4 minutes was up I turned it off and let it naturally release the pressure until it unlocked. They were much more tender this time around, not chewy like they were before. Thanks! How long did you natural release for?? I have searched hi and low, and I cannot find a “PRINT’ button for your cubed steak and gravy. don’t you want to let us print them? O wow I did not have it on that recipe! I just added it thanks for letting me know. July 19, 2018 — Still no Print button? Can you do this without thee onion soup? Or what is a good sub? You could use another soup, maybe mushroom soup…or even beef stock for the total volume of a can of soup plus a can of water, then use a bit more thickener at the end. 7 making this tonight cross your fingers! I’m a new IP user and my meats have turned out tough. How many minuets would I do if I’m cooking 12 steaks? Thanks! Sure you do by now! Don’t be afraid to experiment with it!! But just add mins in small increments so not to dry out the meat. And it comes back up VERY quickly!! Like in 1-3mins usually. Good luck!! Can you please explain what you mean by “natural release”? I’m assuming this is not a quick release. But it could take anywhere from 10 minutes to 15 or so if you just let the pressure go down “naturally”. I think with that difference between pressure cookers could mean that results would vary quite a bit. This terminology is confusing because Hip Pressure cooking website has a natural and a normal and that is confusing too. In fact, the only time when it is not confusing is when someone writes 10 minute natural or quick release. can I double the soup/water to have more gravy or will that interfere with cooking meat? am brand-new to into-pot. Can you make this recipe with frozen cube steak? I did natural released per your addendum and definitely it was needed. I love the flavor of this! I added new potatoes in here while it all cooked and they were perfect when it came out. Voila! cube steak, gravy, and potatoes all in one pot. Perfection! This was my first meal in my pressure cooker. It came out great. I sauted meat first after seasoning with salt, pepper, and cajun season all. The meat was very tender and the flavor was fantastic. Gravy was a little thin. I didn’t add any thickener but could have. It was still great. Normally, I don’t like cube steak & am not a big gravy fan either. I decided to try this for my husband & we all loved it including my kids! I did a natural release and also pan fried mine with some seasoned flour. We served with salad and mashed potatoes. I will definitely be making this again. Thanks for the recipe! Followed recipe exactly and it was perfection! Did potatoes in IP first and mashed while cube steak cooked. Best IP dinner yet. I was just trying to figure out how to do my mashed potatoes in the instant pot with this recipe for tonight. Thanks for the info. By the time the potatoes are mashed -the meat should be about ready!! I did 2 lbs and at 4 mins natural release they were tough. Stuck them back in for 4 more mins. We shall see! Has anyone cooked potatoes with the meat before? I have. I have a power pressure cooker so I put the meat & ingredients in then put the steamer tray in and potatoes on that. Did great. I think for things that take longer to cook though, the potatoes would be mush. Made this tonight for dinner. Followed instructions exactly except I added new potatoes on top and set Instant Pot on high pressure for 15 minutes. Took meat out and made the gravy thicker with some corn starch. The meat was delicious. Very fork tender. Will definitely keep this recipe. Thanks for sharing! You can always tenderize cubed steak by placing it between two sheets of wax papee and hiting hard with the bottom of a beavy frying pan. Always mae it fork tender. Usinf mechanical tenderizers at home has never worked fir me. I am anxious to see if instant pot makes it as tender. apart. But still very good I used golden mushroom soup. Did you have the meat department tenderize the meat for you? cooking tonight with Elk…glad to see someone used venison and was good…. Just asking: I noticed some people are flouring the meat and using the stovetop for browning. Is this because you don’t have sauté on your pot? I have the 6 quart IP and it will sauté then pressure cook. 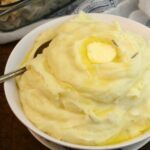 I peeled and pared the potatoes and placed in steamer basket in instant pot with 1 1/2 cup water. Topped that with corn on the cob. Sealed and cooked at high pressure for 4 minutes. used instant release. Placed corn in baking dish with pats of butter to melt so corn would be ready and placed in oven to keep warm. while removing from oven, rolled the cobs back and forth in the butter so they were buttered and ready to eat. Mashed potatoes while your Instant Pot Cubed Steak and Gravy cooked; then placed potatoes in oven along with the corn. Removed the Cubed Steak to platter to make the Gravy by adding the corn starch. Luscious meal and so easy and only 1 pan to clean! Followed your recipe to the letter. The natural release made it fork tender! You never said when to put the Ajus in, I added it into the onion soup, is that correct? Can a package of onion soup be substituted for can of French onion soup? How much water would be added to package? I bought the 8 qt Instapot for my family of 6. When placing the steak in the pot, does it have to be in a single layer or can I stack like in a crock pot? Also would I need to add more water and/or time? Thanks for your help! Can’t wait to try! I have 2.5 lbs of frozen cube steak. Any idea how I would adjust the time to make this? I have a stove top pressure cooker would I still cook for the same time? I made this recipe for dinner October 10, 2017. It was very tasty! I added two extra minutes to cooking time because my meat was frozen. Also, while on salute to thicken, I added some frozen mushrooms and served with mashed potatoes and corn on the cob. This was Ahhhhmazing!!! My family loved it and has requested me to make it again real soon. I did a natural release and the steak was fork tender. Thank you for such a wonderful easy recipe!!! A jus mix… my grocery store didn’t have it! I bought brown gravy mix to replace it. It’s the powder mix we put in the bottom of the IP and put the meat and soup over, correct? I tried it tonight with my new IP (my first thing I’ve made). I did a slow release as recommended and it was still dry and hard to chew. However, when it got done with the slow release of pressure it was another ten minutes before I opened it because my husband wasn’t home yet. Could that be why or has anyone done it for three minutes instead? It was tasty. Was disappointed in this recipe. Followed the directions exactly. High quality cubed steaks from the local meat marked and still tough. Flavor was just “okay” for my families liking. Did not have that home cooked flavor but that of the cafiteria. Very quick and easy. My husband loved it. My complete meal was ready in 20 minutes. This is the third recipe of yours that I have prepared. It was delicious. It was so good that it would make a tadpole whip a whale! This recipe is AMAZING. Super easy to make with satisfying results for someone new to the IP. I read others post and followed the suggestion to dust with flour and brown before putting them in the pot. Outside of that I didn’t change a thing. The time was perfect and natural release is a must. I served it with rice & corn. Only thing I’ll do next time is make MORE! Made this as our Sunday lunch today. So good. I did pre brown in the pot first, in batches, used a little of the soup to deglaze the pot before following recipe as is. Also as some posted, I did 15 min, manual, 10 min natural release. Sooo good!!! This is about the 5th recipe I have made of yours. They are all so family friendly! Thank you!!! The gravy was really tasty but the cube steak was as tough as shoe leather. I don’t think I will make again unless a different cut of meat is used. Absolutely delicious, and if were any easier it’d be take-out! My husband thought it was a joke when I told him it only needed to cook for four minutes. The cube steak was fork tender but still held it’s shape and did not get mushy at all. What a great quicky meal for a busy work day! Thank you! Do you make the au jus gravy then put it in the instant pot or just put the powder in? If the steaks are frozen, how long would I cook them? Just made this for Sunday lunch. 3qt mini instant pot. 1 1/2 lb cube steak. I did flour and brown slightly before putting in the pot. Used maybe a third of a package of au jus. One can onion soup. Thickened the gravy a little with corn starch at the end. Turned out great. My husband was a happy guy. These were amazing! I made a mistake & had to cook 2 meals the same night so the meat wouldn’t go bad. Since this would have gravy, I decided to have this be the meal that we would reheat & eat the next night. (I know, it seems to defeat the Instant Pot purpose, but you do what you gotta do.) It was fabulous! We will be making this again! I bought thin cut round steak since cube steak was unavailable. Do I need to increase the time? I like my cube Steak Breaded. I use egg, flour and bread crumbs. Could you do that first, they fry the pieces and then follow your receipe. I have made the recipe for your cube steak in my instant pot it is absolutely delicious. 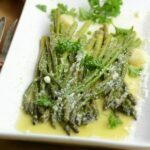 Prior to finding this recipe I always fried it and I would have a difficult time eating it as it would be dry. This is so much quicker and easier. I am also a nurse so any recipe I can make in my instant pot is going to be made there for quickness to make a good meal that doesn’t take forever to prepare. Do you remove the cube steaks before adding the cornstarch? Substitution for the french onion soup? (we don’t eat/like onions). That was the same question I had until I watched the video. They just poured the powder in so that’s what I did. Turned out great! I enjoy this recipe weekly. It pairs so well with potatoes and a green vegetable. Thank you for this recipe. This is the only way I’m able to make cubed steaks! This was my very first recipe with my new IP, so yummy and easy to make. I added a package of fresh mushrooms to it and I did use the cornstarch at the end to thicken up the gravy. Even my picky 9 yr old likes it! That’s a win! Thanks!! Looks delicious! Just wondering if the “burn notice” will come on if the powdered Au Jus mix is poured in there? It’s very frustrating when you think everything is good, waiting for the pressure to build up, while working on something else and the notice comes on. Will keep you posted as we are having this for dinner tonight with some mashed potatoes and peas. Can you use frozen cubed steak on this? Or would you recommend thawing first? At what point do you add the Steak Sauce? Cooked this tonight but the meat wasn’t very tender. Any suggestions for next time. The flavor was amazing. I’m new to IP. What is a natural release vs. a quick release? This sounds delicious! Do you think I could use a package of dry onion soup mix in place of the canned soup? With some extra liquid, of course. Can’t wait to try this! So Walmart substituted bottled AuJus vs. a dry packet. Do I use the whole 12 Oz bottle or make any other adjustments? Made tonight. Delicious with some mashed potatoes. And easy, easy! Easy to shop for, too! Thank you from this busy momma! Made this last night Dinner turned out really good. Real tender, will be making this again. Surved with mashed potatoes and green beans. Very Good. New to IP and only the 3rd Tim using it. After the natural release then quick release, how long do we sauté and boil?